All day at work, in between reviewing contracts and drafting memos, I was imagining all the yummy wee cakes that would look oh-so pretty as roses. It kept me up last night, tossing and turning - would the 12 muffin 1/2 cup capacity pan be better, or the 6 muffin 3/4 cup capacity be more practical? Dainty and pretty vs hearty and substantial? C reckons it's all a bit silly, you have plenty of muffin tins, Nessie, he says. C: They'll taste the same you know. Me: Yeah but they will be prettier, you eat with your eyes first, C. So there. I think I won that wee argument don't cha think? But then there's the price consideration: NZD$70 - is that just far too expensive for a pan? 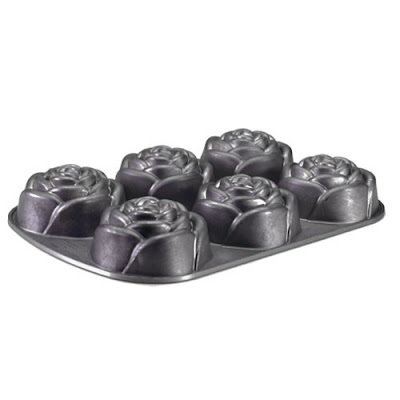 And a matter of priorities: should I get this rose pan first OR the madeleine pan that I've had my beady little eyes on? I encourage it too! Also, I would recommend dainty; my sister has that one and it is great, and I have the sunflower one in the bigger size but you really have to cut the cakes in half as they are a bit big for a single serving - so dainty really does win, I reckon! I bought a classic bundt tin from www.thedeal.co.nz for $43 - a bargain for a Nordicware tin. They have the little rose cake one too. They're fantastic pans - you'll have it forever. And at only NZ$43 for the bundt tin maybe you can get both the bundt and the madeleine tin! Someday, when I don't have flatmates who sometimes use metal knives/forks on non-stick pans and baking tins, I will let myself buy lots of pans. mel: Oh man I feel your pain. They should totally invent scratch proof non-stick baking pans! definitely get them - you can never have too many cake tins!! !